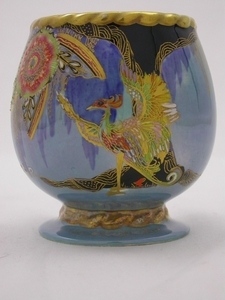 A beautiful�vintage vase by Carlton Ware in the very rare and sought after Secretary Bird pattern in the steel blue lustre ground (4106) which was produced between 1937 and 1941.� This pattern is extremely hard to find and even harder to find in the steel blue lustre colourway.� It carries the standard Carlton Ware backstamp used during this period.� It also has the impression 1643, which refers to the shape number.� It also has the numbers M1/2245 4106 painted on the base, which refers to the pattern number.� The Secretary Bird pattern is another of the outstanding art-deco patterns designed by Violet Elmer.� This vase is extremely rare and a very collectable piece. Its main feature is a fabulous fan-tailed bird, sometimes referred to as the "road runner".� The entire bird is enamelled in every colour available to the paintresses and appears to be standing in a canyon in front of high cliffs and a waterfall.� Equally impressive to the bird is a secondary pattern of a fabulous flower and leaf design that is similar in style to other art-deco geometric patterns designed by Violet Elmer.� The vase stands on a pedestal base with a rope of gold around the stem.� The same gold rope is around the rim of the vase.� The inside is a mother of pearl lustre. It is in excellent condition, having no repairs, chips, cracks or stains.� It does have very minor crazing, only to the base and mother of pearl interior, which is usual for pieces of this age.� The steel blue ground, enamelling and gold trim are in excellent condition.� The colours are bright and vivid and this vase is in absolutely pristine condition, obviously spending it's life as a treasured item in a cabinet.� Any white marks are light reflections.